Hailey has a plastic tea set she got for Christmas that she plays with all the time. My sister Lauren and I used to have matching ceramic tea sets when we were little that we played with. I recently found Lauren's set out in my parents' garage and she was kind enough to let us use it. When Steve or I have time to sit with Hailey at the table and supervise her we pull it out and she just can't get enough of it. So far she has had "water" tea and "pink lemonade" tea. Life's hard when you can't decide which cup to drink from. So far she has been eating crackers with her "tea" and it reminds me of prison food. 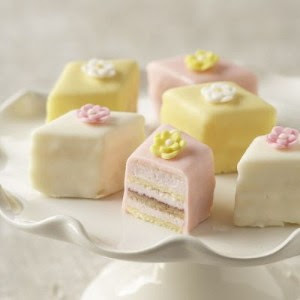 I thought it would be fun if I got her some petit fours. Steve thinks I am crazy. I think he has a lot to learn about little girls.... maybe it's not his fault. I seriously doubt he was invited to many tea parties when he was little. I say it's never too late to learn. Fortunately for Hailey, despite what her father thinks, I am going to order them anyways. As you can see this is serious business . . . and we upgraded the cracker to a cupcake in the meantime. She knows how to pour. She just doesn't know when to stop until it is too late. "Ching Ching," as Hailey likes to say. Then a lick with her tongue. Got to love those cute leggings!